Positive Psychotherapy for Psychosis describes a new psychological intervention, which for the first time applies emerging research from the field of positive psychology specifically to psychosis. 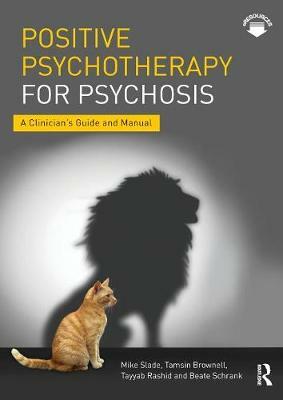 The book contains guidance on adapting the approach for use in individual treatments, and on providing part of the intervention, either as individual sessions or by integrating Positive Psychotherapy for Psychosis sessions into other treatments. Divided into two sections - Theory and the Intervention Manual - this book offers methodologically rigorous research, case studies and detailed aims and instructions for clinicians and therapists. The structured, step-by-step manual, for use with clients, includes downloadable handouts, session materials, activities, guides and therapist tips. The manual will be a practical, positive and innovative resource for mental health professionals, providing all the material needed to deliver this evidence-based approach that is designed to improve wellbeing and reduce symptoms experienced by people living with psychosis. Positive Psychotherapy for Psychosis will be of interest to mental health clinicians working with people with psychosis, as well as clinical and counselling psychologists, psychiatrists, mental health nurses, psychotherapists, social workers, occupational therapists, support workers and peer support specialists.